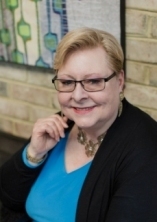 Review of Faith Shearin's "Darwin's Daughter"
Faith Shearin is the author of six books of poetry: Darwin's Daughter, The Owl Question (May Swenson Award), The Empty House, Moving the Piano, Telling the Bees, and Orpheus Turning (Dogfish Poetry Prize). Her work has been read aloud on The Writer's Almanac and included in American Life in Poetry. She has received awards from The Fine Arts Work Center in Provincetown, The Barbara Deming Memorial Fund, and the National Endowment for the Arts. Her work also appears in The Autumn House Anthology of Contemporary Poets and Good Poems, American Places. She lives with her husband and daughter in a cabin on top of a mountain in West Virginia. The poems in Faith Shearin's Darwin's Daughter explore many variations of love and loss, time and memory, beauty and violence, creativity and imagination flowing and stifled, hope and despair--so many of the complexities that thread through our lives as humans. Her work is infused with an irresistible sense of awe, honesty, kindness, and reverence. The poem ends with a haunting image: "now the child is becoming the flowers / which are also temporary: cut, // unable to drink, their petals tender." Again, we are taken inside a moment of transformation, and reminded of how fleeting life is. the island, and we were the sea. The idea of living on an island in the sea is explored earlier in the poem with the lines: "my teacher / explained the difference between submerging / / and emerging coastlines." This image of edges, doorways, or thresholds repeats in the poem titled "Liminal States:"
The poem is filled with these in-between places, moving back and forth in time, stopped in the sliver of a second before something momentous happens: "This is just before the baby is born...my mother / is in the waiting room but no one has told // her she has cancer; my father's car / is spinning, but he is still conscious." the fruit to his lips, knowing it is almost gone. That last line holds such power, suggesting that the grandfather knows the fruit is almost gone, as well as his life. all her brothers still alive. She goes on to describe her grandmother as living "alone in her house of memories," and ends the poem with a stunning image that suggests swimming, but implies so much more: "In this blue lane she moves slowly, not wanting to reach the end." This suggestion that she doesn't want to reach the end of her life echoes so beautifully the last line of "He Ate Peaches" in which the grandfather knows his life "is almost gone." of the same book, word by word. The center of the poem contains an essential idea that repeats throughout the book: "He believed that all life was related, descended // from a common ancestor." screams and groans: a Siren song. our eyes luminous in the dark. to eat leaves, and freedom, and roots. In "Escapes" she praises the animals in the zoo who figured out how to escape: "I want to be / the bobcat who leapt out of his // habitat--man-made wall, / man-made moat--to lie beside // a singing tree." This theme of escaping connects to poems about various ways we humans are sometimes not able to escape our situations at times. In "Houdini's Escapes" she says, "Surely he would have known how // to get out of unhealthy relationships / and PTA meetings, how to // cancel a holiday with enemies." The poem ends with her wishing she "could ask him how he // did it because every escape requires / its own courage and dexterity; // every escape is also a show." There is also a thread that runs through many of these poems exploring and celebrating imagination, creativity, voice, language, photography and visual art. In "Southern" she says, "It was the language I loved: / the way my great grandfather said the word / sassafras to amuse himself / and the aunties, surprised, / said I swan instead of I swear." In "Mary Shelley, Creating Frankenstein," she says, "Mary invented // a pale physician kneeling / beside a creature he had stitched together / from grief," mirroring Mary's creating the tale after all the deaths she experienced. "Frances Glessner Lee" describes a woman who "Loved miniatures: made tiny replicas of rooms / that captured her imagination, recreated / the stiff chairs, the oil paintings of angels, / a pair of wire-rimmed glasses on a bedside table." Besides poems about family and ancestors that thread together a personal history of connection, this collection also contains poems about our larger human history and mythological figures that connects us all. "Lucy, Falling" tells the story of "three million years ago...our [tree-dwelling] ancestor: / falling through time." She speaks of "our miniature /ancestors" in "The Hobbits of Flores." In the imaginative "Eve, Growing Old," she begins with the idea of Eve depicted in paintings "at the edge of a blooming paradise" and ends with the image of "Her hair turned white, then fell out," and the idea that, being the first woman, she is "unmothered:" "she had no picture of her grandmother / on the bedside table to comfort her, / no ancestors waiting for her in myth, / or memory." Many poems are celebrations of famous people who made various types of discoveries (Darwin, Alexander Fleming, Henry Hudson, Lewis and Clark), well-known authors and their imaginative works (Emily Dickinson, Thomas Lux, Sylvia Plath, Ann Sexton, Mary Shelley, Virginia Woolf), famous entertainers (Elvis, Houdini, Marilyn Monroe), of epic adventurers and mythological figures (Blackbeard, Guinevere and King Arthur, Penelope and Odysseus), and of historical tragedies such as the 1911 Triangle Shirtwaist Factory Fire, the sinking of The Titanic, wars, nuclear disasters, and The End of the World. which she began, but never seemed to finish. The above lines touch on the sometimes randomness of life and its accidental discoveries. The poem ends with whimsy and reverence: "I praise / that open window, his mess, the mold / drifting in." through smoke for the lives they left behind. leaves trembling, her skirt alive. What a sense of breathtaking beauty, hope and wonder is expressed in the images of the women like "stalks of flowers // remembering the wind," and the girlfriend being carried through a garden "leaves trembling, her skirt alive." 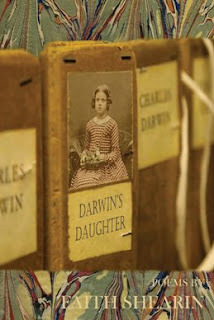 Faith Shearin's Darwin's Daughter shimmers with poems engaging fully with life, paying deep attention to all its duality--its mystery and beauty alongside its disappointments and losses. These are poems you'll want to read more than once. They pull you in, resonate deep within you through gorgeous, layered imagery and genuine emotion, reminding us of our strength and vulnerability, and our complex connections to each other and the natural world. Karen George retired from computer programming to write full-time. She lives in Florence, Kentucky, and enjoys photography and traveling to gardens, museums, historic river towns, mountains, and Europe. She is author of two poetry collections from Dos Madres Press: Swim Your Way Back (2014), and A Map and One Year (2018), and five chapbooks, most recently The Fire Circle (Blue Lyra Press, 2016) and the collaborative Frame and Mount the Sky (Finishing Line Press, 2017). You can find her work in The Ekphrastic Review, Sliver of Stone, Heron Tree, and America. She holds an MFA from Spalding University, and is co-founder and fiction editor of the journal, Waypoints. Visit her website: http://karenlgeorge.snack.ws/.